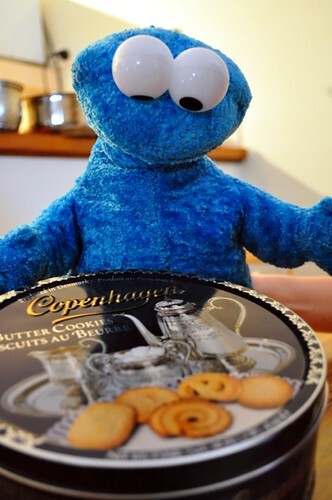 I don’t know about you, but I’ve never been one for biscuits or cookies, finding them too dry and boring. 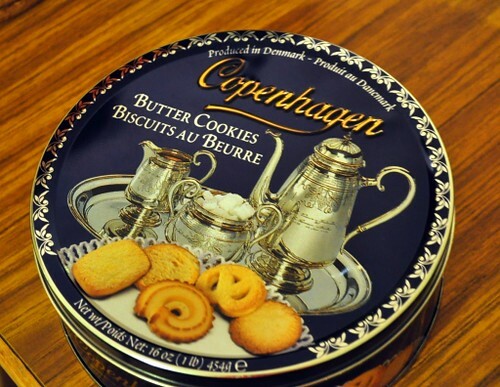 But during the weekend, I spotted these tins of Danish butter cookies in the supermarket and just had to buy them because they reminded me so much of my Ah Pa and my childhood. 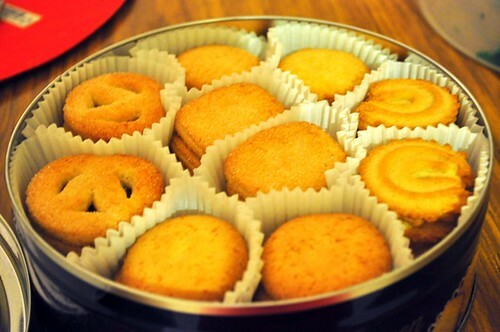 My father loves biscuits, cookies (and most sweet treats) but he really likes Danish butter cookies and when I was young, his room would somehow always have a tin of Kjeldsens butter cookies (the most famous Danish butter cookies?) with their bright blue and yellow hue. We all had our favourites, I think Jo’s favourite was the choc chip cookies while I had a penchant for those sugary ones. Anyway, I was actually quite excited when I peeled off the tape surrounding the lid. Even though they were not Kjeldsens, I think they’re actually made by the same company. To my shock, I realised there were no choc chip cookies in this version!! How can?! But I was still very happy seeing the familiar rounds of cookies, and knowing that there would be another layer underneath. Nostalgic. 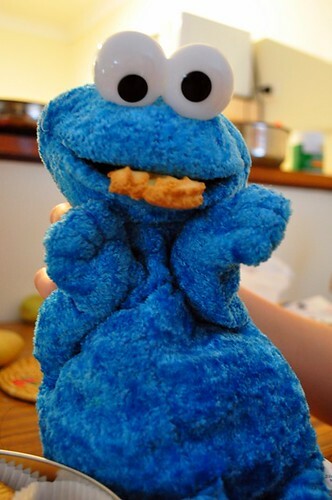 I went for a sugary one straight away while the cookie monster chose the swirly round one. 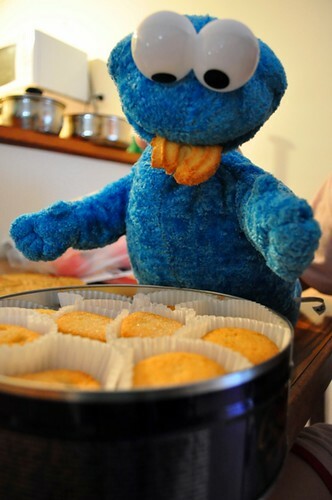 Happy cookie monster Y(^____^)Y. I know it will be a terrible work week ahead, but at least there’s comfort in knowing that familiar, sugary, warm and happy things will be waiting for you back home. It was a very slow work day. 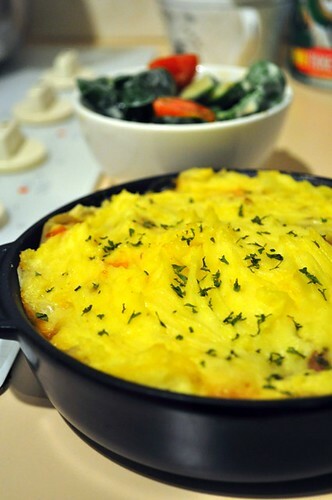 Cottage pie and tomato cucumber salad for dinner, another case of using up the leftovers. Another 2 more days till the weekend, will it never end? The weekend is over again!!! (T_____T) It was a scorching one and I’m still waiting for the thunderstorm to break with no avail. But at least it was a great foodie weekend with lots of good company. Saturday brunch with Jo and HC was at Crumpet (8/885 Albany Highway, East Vic Park), the new breakfast place just near my home which I’ve been dying to try for a while. The food reviews given were all good and best of all, they had excellent coffee reviews. 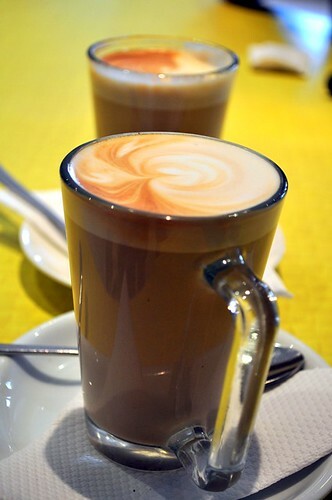 I knew it wouldn’t take much to convince fellow coffee lover HC to give it a try and I was right (^__^). The coffee ($2.9) was pretty good! Pretty latte art is always a bonus and nice to look at. Even though I’m not a fan of crumpets, scones or pancakes and the like, it felt wrong not to order crumpets ($4) at a cafe called Crumpet so we ordered one to share. 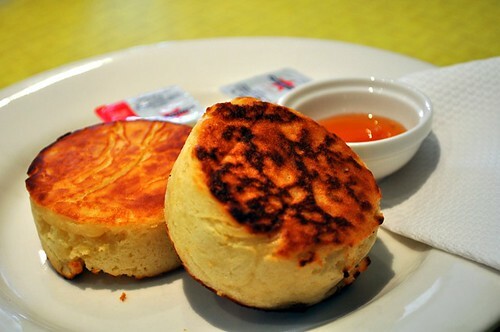 The crumpets came with honey and butter and were nicely hot and buttery. Not bad even for a non crumpet lover like me. 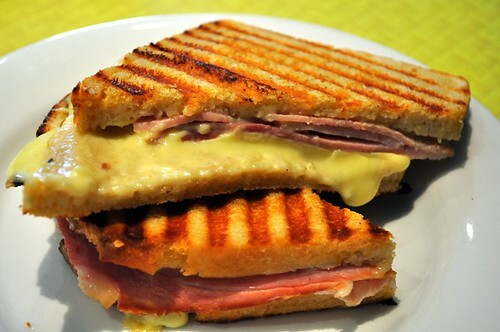 My croque monsieur ($7) which is a basically a grilled ham and cheese sandwich was very nice, I’m not sure there’s much you can go wrong with when it comes to toasted sandwiches, but this one was nicely done, crispy and melty, yums. 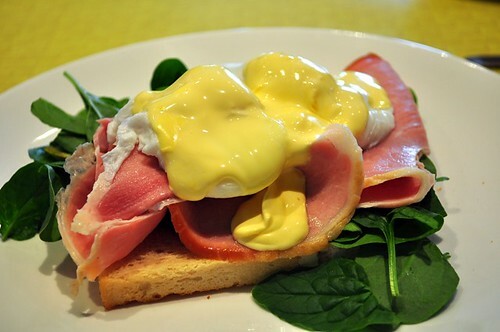 HC’s egg benedict ($12.50) which I didn’t eat but looked good. I forgot to check the texture of his poached eggs but I’m sure they were alright. 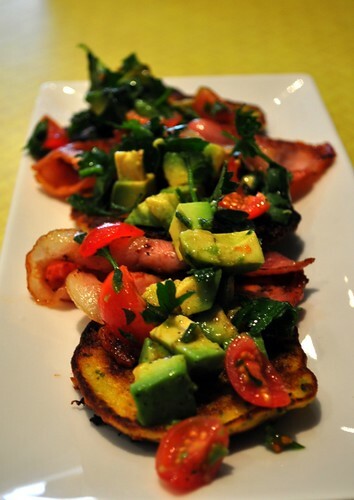 Jo’s brunch was very fresh and tasty, sweet corn fritters with avocado, bacon and cherry tomatoes and lots of herbs. It was nice and light and very refreshing. Overall I liked Crumpet and thought that the portions were generous, prices were affordable (it’s hard to find coffees under the price of $3 nowadays, Perth coffee prices are crazy) and most importantly the food was nice and tasty. The only problem I had with Crumpet, bad insulation/ventilation made the cafe extremely hot and uncomfortable in summer, they need some fans or something? Otherwise, I would definitely return. Weekend dinner special was a Scoopon deal! 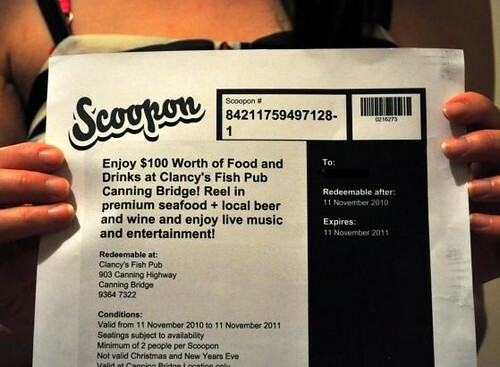 If you haven’t heard of Scoopon, get on it now, it’s the new craze in Australia where you go to a website like Scoopon which has ‘deals’ everyday e.g. restaurant discounts, massages etc., and if enough ppl ‘buy’ the deal, the deal is on. This was our first ‘deal’ purchase and it was such a good deal, $40 for $100 worth of food. I’ve been past Clancy’s fish pub a few times (while on the way to Ipoh Garden next door haha) but never thought of it as a place I would go to not being a pub food fan but this deal was too good to miss. 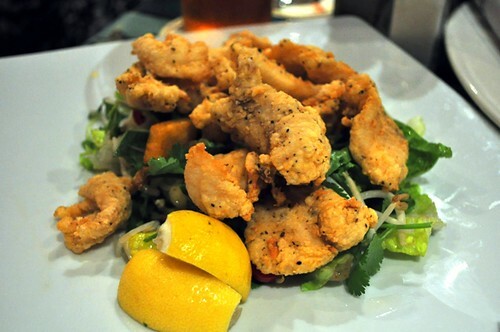 So for $40 we had a seafood platter for 2 which frankly, was just average. 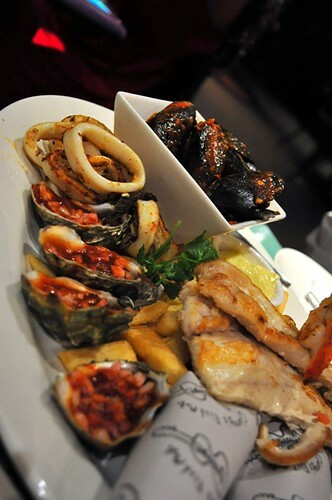 I’ve had much better seafood platters elsewhere but really, I can’t complain because it was such a good deal and the seafood while average, was still fresh and fun to eat. We also had another main of Szechuan Snapper Salad which wasn’t very asian at all, I guess they got the name szechuan from the use of szechuan pepper in the batter seasoning? Otherwise this snapper was nicely fried and well seasoned. Completely stuffed after this meal but it was fun, I love Scoopon and will be visiting often to check out other deals (^__^). Ok, end of weekend post and back to sad workdays again, bye! There’s a neighbor that plays piano every night, it used to be quite soothing but recently he or she has started practicing LATE at night. Luckily it’s the piano and not er hu or violin I guess. Then the piano started again early this morning. This time I didn’t mind because it reminded me of the church bells that we would hear back home in Kuching while lying in bed on a Sunday morning. Then we would get up, brush up and soon ah Pa’s organ tunes would drift up the stairs. All pile into the car and Ah pa would ask ‘Chiak har mik?’ (What should we eat?) And we would take turns saying ‘Chin chai‘ meaning ‘whatever, anything’. In the end Ah pa would just head off to our usual bak kut teh place (I can imagine Jaso drooling as he reads this) probably thinking why he even bothered asking in the first place (-_____-)”. I think Jan is coming home for CNY next year, if Darren flies home as well, we’ll all be home for CNY so exciting. I am already imagining all of us piling into the car and Ah Pa asking us where we want to go, but I’m quite sure this time we will have lots of answers for him. Btw good friends and family, go check out the class photo of me in primary school, a primary schoolmate found me on Facebook (how do they do this? It still amazes me!) and tagged me, it’s a hilarious photo, my spectacles take up half my face! And I’m wearing a hairband, so old school. I think I have ‘nerd’ spelt across my forehead too, except while I looked like a nerd, I never studied , sigh… it’s funny lah, so go and have a look! Anyway, when it wasn’t so hot a couple of days ago, I actually did some baking. 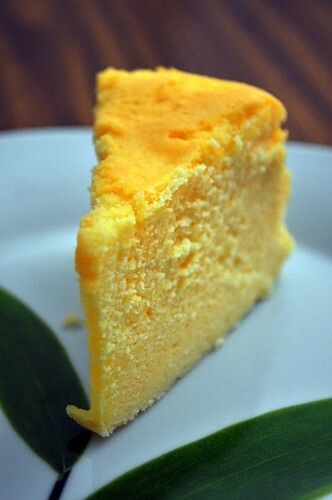 This time it was a Japanese Cheesecake. After getting tips from my mum, she said that I was making her ‘itchy’ (I thought people only use that term when playing mahjong!) and she baked one the next day too! Hehe, before you know it, Jan will be baking from her kitchen in London. The cake actually turned out quite good but I was looking for an even softer texture. After a couple of days in the fridge, the texture is now rather dense and creamy, not so Japanese cheesecake but more Western cheesecake. But never mind, because it’s also cold! Friday steak nights are back! 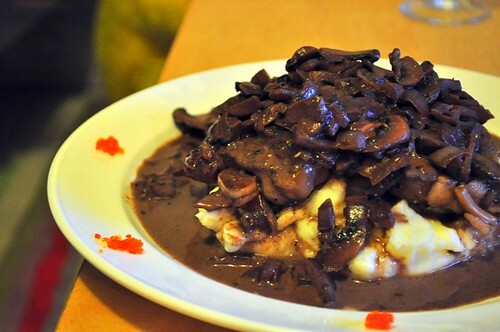 Mine was overloaded with mushrooms, I tried a new mushroom sauce recipe, yum yum. Saturday we tried out the new Vietnamese restaurant ‘What the Pho’ (catchy name) that has been garnering good reviews. Unfortunately, it was a huge disappointment. 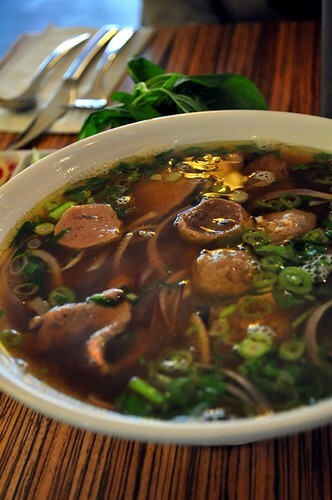 The pho was lacking in depth, no beefy flavours, lack of those herbs that we love so much in phos. Sigh, disappointment. 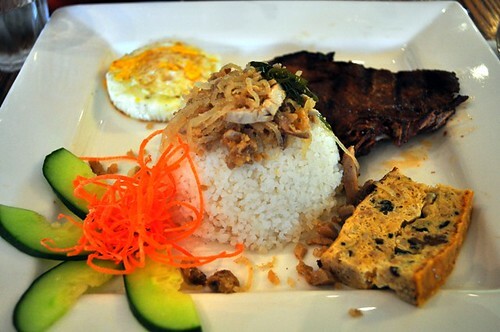 The pork chop rice which I thought all Vietnamese restaurants never go wrong with, was very ordinary. I’ve had much better pork chop rice elsewhere. To be fair, the atmosphere and interior of What the Pho was very nice and comfy. The service was excellent too. 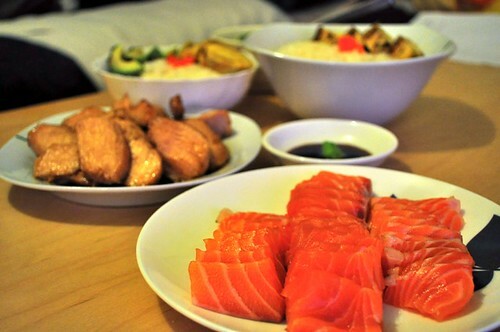 But the most important component, the food, was somehow lacking. Homecooking! 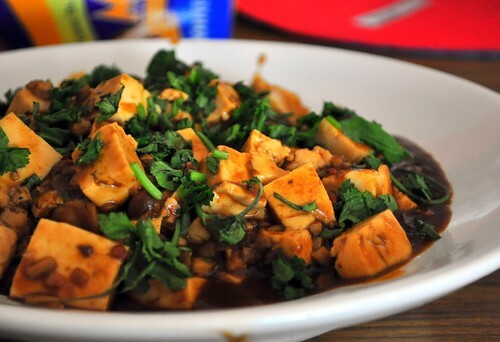 Finished up the whole pack of tofu with mapo tofu. 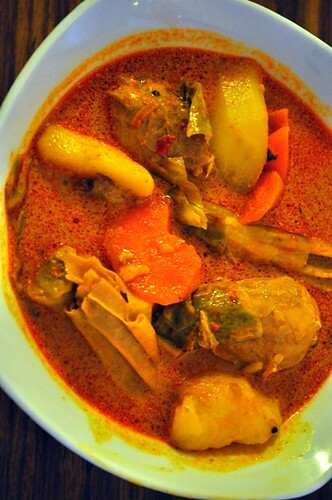 Chicken curry or more like vegetable curry because I loaded it with veggies like cabbage, carrots and beancurd sticks. A tad spicy but still good with rice. 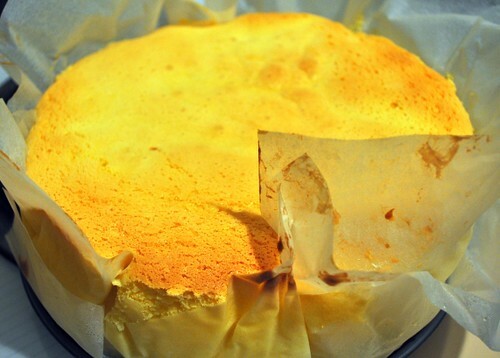 I’m going to bake a cheesecake tomorrow, wish me luck! You know that something tastes really good if you immediately want to recreate the same dish when you go home. 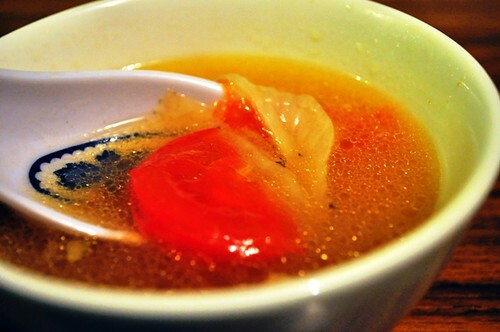 That’s how I felt about the pickled vegetable tomato soup that we had at the chicken rice place. Somehow mine didn’t turn out quite the same and wasn’t as good, but it was still tasty and comforting with steamed rice for dinner. 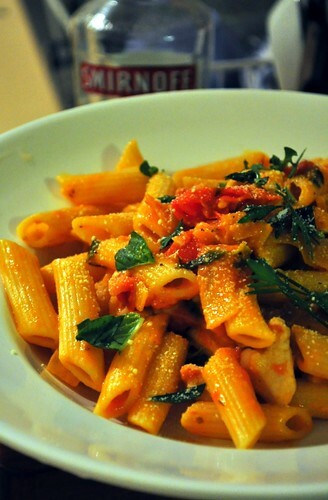 It’s been a while since I’ve cooked pasta, this time it was Penne Alla Vodka which was a tomato cream sauce pasta which didn’t really taste of vodka at all. I might need to be more generous with the vodka next time. Did you notice that everything is tomato based? Richard came home with a box of tomatoes from his colleague last week and we’ve been eating lots and lots of tomatoes all week, in fact, we’re almost done! It’s Friday tomorrow! Hooray hooray.